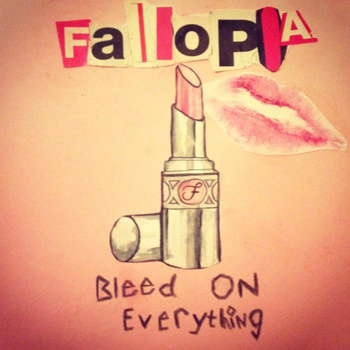 Fallopia’s Bleed On Everything is almost everything you’d expect and want from a feminist punk band. It’s a one-two punch to the face, delivering blunt, thought provoking and anti-patriarchal lyrics accompanied by that classic riot grrrl inspired instrument accompaniment to back it up. The album was released independently by the band in September and comes in at around 15 minutes long, just long enough for that across town commute. Their eight original tracks as well as their cover of Bikini Kill’s “Rebel Girl,” cohesively work as a whole. It takes a lot of effort for any band to accomplish this and I applaud them for it. Instrumentation is simple. These musicians play to their music and by that I mean they’re not overcomplicating their parts because ultimately the music accompanies the message on this album. The album does fall short, though. It isn’t mixed very well and awkwardly places the parts of each musician on different planes. Levels are all over the place and range so differently per song that it makes it hard to pinpoint where exactly to start. In some ways it takes away from the rawness of their music. For future recordings, I’d suggest making things sound less compressed and more atmospheric. Overall, the songs are well written, and despite recording quality, I’m extremely excited for what the band has next for listeners.